The Exeter Spitfires Baseball Club reformed in 2012 and currently operates an adult team in the South West Baseball League, alongside the Plymouth Mariners, Torbay Barons and Bristol Bats. The 2013 season sees the reintroduction of youth baseball and softball programmes for St.Luke's and St.Peter's schools in Exeter. Exeter Spitfires originally played in the Mid West Baseball League during the 2000 and 2001 season, but with other clubs closing down the team had no opponents or local league to participate in. The most complete resource for club information, history, photographs, rosters and post match reports. Not as immediately updated as Facebook but ultimately it all ends up here, better organized and more clearly presented. The official Facebook page for Exeter Spitfires and the place to find Event details for upcoming games, training sessions, club meetings, and promotional activity. Also plays host to team/match photos and a little bit of baseball chat. Mostly used for brief announcements of upcoming fixtures, weather reports, match scores, training times and places. Home field of the Exeter Spitfires baseball team and named after Henry Chadwick, 'The Father of Baseball' (born in Exeter, October 1824). The baseball field is within the grounds of St Luke's Science and Sports College (from the car park, walk around past the astro turf pitches to the left). The whole complex is next to Sainsbury's (Pinhoe) supermarket. 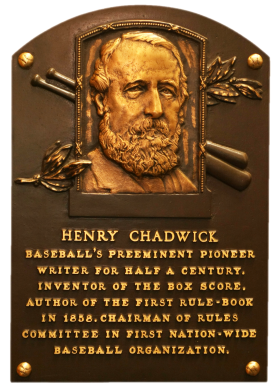 A pioneer of early baseball, Henry Chadwick influenced the game by wielding a pen, not a bat. A renowned journalist, he developed the modern box score, introduced statistics such as batting average and ERA, wrote numerous instructional manuals on the game, and edited multiple baseball guides. He was an influential member of baseball's early rules committees. His tireless work and devoted love for the game greatly aided in popularizing baseball during its infancy. In 1868, Henry Chadwick wrote the first hard-cover book on baseball, The Game of Base Ball.